Since 2017 a global group of economists, which includes some obviously heavy hitters, has been proposing a plan that would use a carbon tax as the best way to reduce US CO2 emissions. The Climate Leadership Council says its members include 27 Nobel laureates, all 4 former Fed Chairs, and 15 former Chairs of the Council of Economic Advisers. Notable names include George Schultz, Ben Bernanke, James Baker, Martin Feldstein and many other economic or political luminaries. Corporate members include Procter & Gamble, Johnson & Johnson and even energy companies such as ExxonMobil and BP. Various leaders of the group have been writing editorials for many leading print and on-line publications, including just within the past week an op-ed in the Wall Street Journal signed by more than two dozen notable economists. Some kind of import tax will need to be levied against countries or perhaps individual company imports into the United States if their CO2 policies are not strong enough. IV. To prevent carbon leakage and to protect US. competitiveness, a border carbon adjustment system should be established. This system would enhance the competitiveness of American firms that are more energy-efficient than their global competitors. It would also create an incentive for other nations to adopt similar carbon pricing. V. To maximize the fairness and political viability of a rising carbon tax, all the revenue should be returned directly to US. citizens through equal lump-sum rebates. 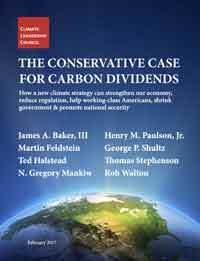 The majority of American families, including the most vulnerable, will benefit financially by receiving more in “carbon dividends” than they pay in increased energy prices. There are couple of interesting points in the above. The “revenue neutral” elements means dollars raised from the tax would somehow be redistributed back to taxpayers, not kept by the Federal government for other spending. This principle is not being adopted, for instance, for the state of California’s cap and trade program. First, the piece says some kind of import tax will need to be levied against countries or perhaps individual company imports into the United States if there CO2 policies are not strong enough, so that companies here cannot avoid the tax by offshoring. Interestingly, Holman Jenkins, a regular Wall Street Journal editorial writer, was not impressed with the plan. To start, Jenkins doubts a law will be passed that will pay the carbon tax “dividend” to the rich as well as those less well off. Jenkins ends by saying nuclear power needs more consideration, as “Overnight the chances of the world dealing efficiently with its climate puzzle would be increased appreciably” if it was more broadly used. What is your take on Climate Leadership Council Continuing to Push for Carbon Tax and Dividend Back to Taxpayers to Reduce CO2? Let us know your thoughts at the Feedback button below.